468 backers pledged £41,595 to help bring this project to life. Having spent the last 15 years assembling high resolution, seamless panoramas from the Apollo Missions, Mike Constantine of space memorabilia website http://moonpans.com has compiled over 50 stunning panoramas into one book, "Apollo: The Panoramas". Each panorama spans a full double page spread (measuring 28 x 10.25 inches) and included are most of the panoramas captured on the lunar surface from all of the Apollo landing missions from Apollo 11 to Apollo 17, as well as panoramas captured from the Lunar Module Windows and the stand up EVA on Apollo 15. Each panorama has a detailed description by the author plus many, also have exclusive comments from the Apollo Moonwalkers who were actually there. 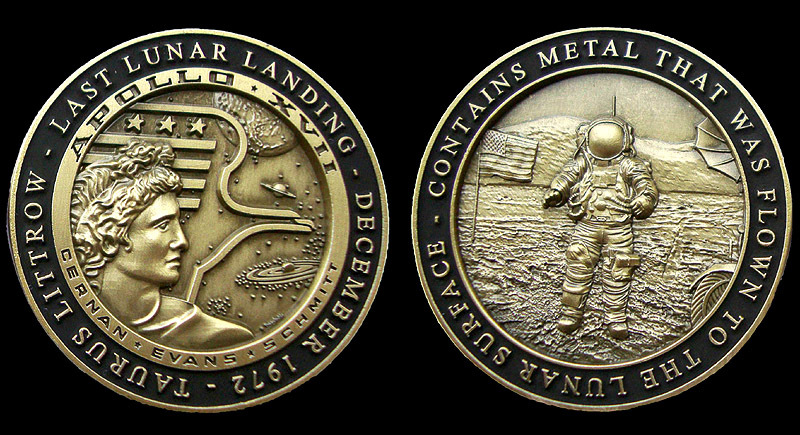 Alan Bean, Edgar Mitchell, Charlie Duke and Harrison Schmitt. There is also a foreword by Charlie Duke, Apollo 16 Lunar Module Pilot. The funds raised from this campaign will go directly towards the printing/publishing of the book. Please note that Signed Copies of the book will be shipped from the UK, so the shipping costs to international destinations will be approximately £29 to £35 GBP due to the size and weight of the book. Unsigned copies will ship from both the USA and UK, so will incur less shipping costs within the USA. This Beta cloth crew patch flew over half a million miles to the moon and back, plus another 3 days in lunar orbit aboard the Apollo 14 command module KittyHawk from January 31-February 9 , 1971. 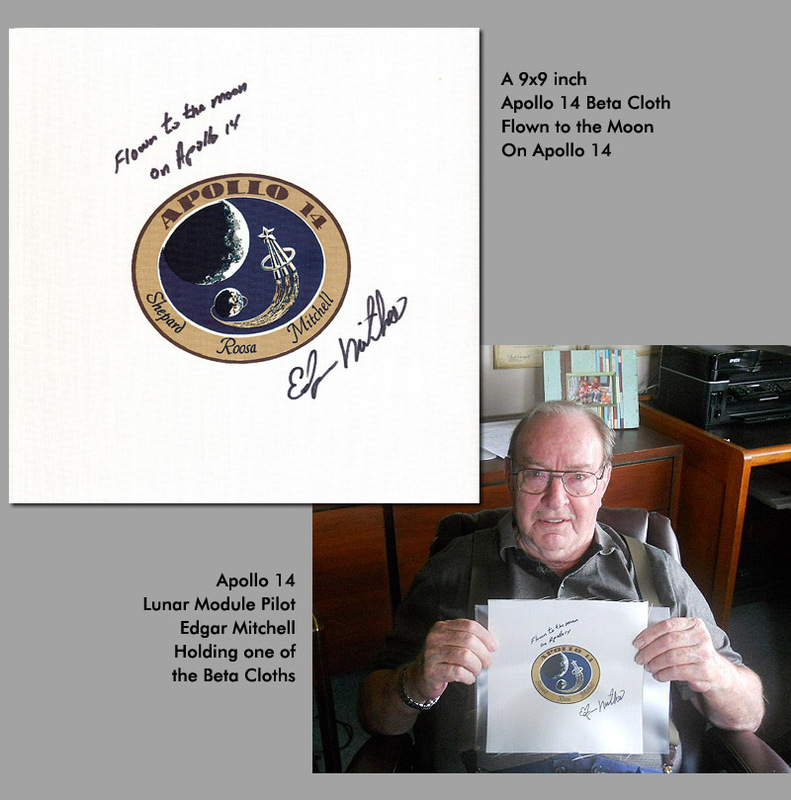 It comes directly from the personal collection of Apollo 14 Lunar Module Pilot, Edgar Mitchell who has also inscribed the Beta Cloth, "Flown To The Moon on Apollo 14, Edgar Mitchell LMP"
We found it difficult to find an established publisher for this book, so decided to go the self publishing route via Kickstarter. As long as the campaign is successfully funded then we are very confident that all will go smoothly, as we are working with an excellent book printer and established worldwide shipping company. We have stated Jan 2016 as the shipping date for the book, but hope that we can actually ship towards the end of 2015. To ensure all rewards are shipped correctly we need to remind all backers to fill in their shipping details with up to date postal addresses. A 20x8 inch Panoramic Print of the books' cover photo (without any text) Shows Apollo 16 Commander John Young at the lunar rover. Plus a 40x8 inch panoramic print, hand signed by Apollo 14 Moonwalker, Edgar Mitchell. Plus a 20x16 inch Apollo 8 Earthise print - hand signed by Apollo 8 Commander Frank Borman. Plus a beta cloth patch that flew to lunar orbit on Apollo 14 hand signed and inscribed as "Flown to the Moon on Apollo 14" by Apollo 14 Moonwalker, Edgar Mitchell.